Lloret de Mar is known as the party town of the Costa Brava, and is very popular with young people looking for holidays with bars and rowdy clubs in the centre of town. Lloret de Mar's ajuntament - town council - is trying to mollify the more anti-social elements, but for this reason, some people coming to the Costa Brava try to steer clear of Lloret. However, as a town, though it is filled with hotels and apartment blocks with a strong tourist focus, it isn't a high rise town, and the beaches, calas and general geographic setting are very pleasant. If you keep away from the 18-30 crowd, you'd find it is popular with families not just from northern Europe and Russia, but also with the Spanish themselves. Lloret's main town beach is right in front of the town and is a big broad beach backed by bars and burger joints. However, we're visiting the neighbouring Fenals beach to the south, which is quieter with a better setting, as a large bay with rocks at both ends, and views down to Blanes, and backed by reasonably spaced out hotels and apartments which don't feel crowded. The reason for the trip is a birthday treat to use some of the water sports facilities - banana boat, parasailing etc that operate from the beach, but also to enjoy the water and try out the location. 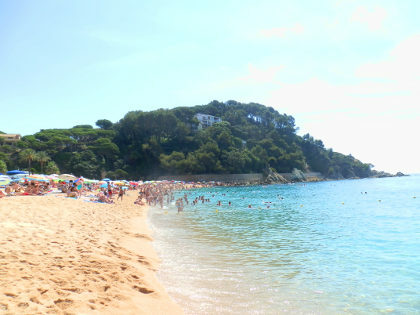 Because this is Lloret, this a beach that does get busy with a lot of visitors - it's not a secluded undiscovered bay, and it is a relatively long beach - for this visit we stayed to the lefthand half. Despite the number of visitors on our trip the water was amazingly clear and transparent - as clean as anywhere we've visited, and out to the rocks on the left-hand side, the water attracts fish and cormorants who preen themselves on the rocks right next to sunbathing tourists. The sand is gritty, similar to other Costa Brava main beaches such as Tossa or Platja d'Aro, though the 'sand' isn't harsh under foot. Entering the water, the bay shelves quickly, so you're quickly out of your depth. However, as said the water was lovely on our visit and it was very satisfying to make a long swim. Behind the beach are tourist town type facilities - shops selling beachwear and inflatables and bars and restaurants. Unlike most other parts of the Costa Brava, Lloret is about the last town remaining where you will find British pubs and bars among the range of eateries on offer. However, it's possible to enjoy the beach without getting swept into the tourism thing. Parking nearby is difficult - all the parking was taken in the streets closest to the beach, so we parked out a little way and walked in. This is a major beach with lifeguards. There are also water sports operators for motorised 'fun' sports being towed by a speed boat operating on the beach itself. 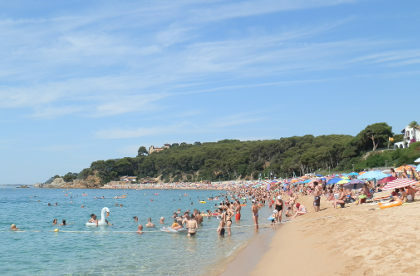 One area of the beach is used by the Dofijet boat service that connects the beaches between Tossa de Mar and Malgrat de Mar on a shuttle service - swimming is out of bounds in this area, and enforced by the lifeguards. Behind the beach are the facilities of a tourist town, but most a little way in, so the promenade at the back of the beach retains its charm. The sand is gritty but smooth, so not great for sandcastles, but not a problem underfoot. On our visit, the water was very very clear and invited swimming. Being a big bay, long swims along the bay are possible, and because it gets deep relatively quickly, it gets more busy close to the shore, than out in the better areas for swimming. For snorkelling, the rocks to the left had shoals of fish and areas to explore. We found parking difficult, with spaces close to the beach and the neighbouring streets already full when we arrived. Parking a little way off the sea is fine if you're prepared to walk. The beach is on the GR92 (part of our Blanes to Tossa de Mar walk). The path runs around the rocky Cala Banys before getting to the main town beach to the north. To the south, the paths head to the gardens of Coltilde, and the (naturist) beach of Boadella and down to Santa Cristina. The hills at the back of Lloret have a lot of estates will holiday houses and villas, and is an area we haven't explored much.